Chronic neck pain can be caused by a number of structures in the spine, including the cervical facets. 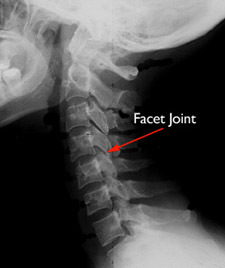 The cervical facet syndrome is a cause of neck pain that is due to disease in the small joints of the spine called facets. The pain is located in the neck, shoulders and head. It may radiate down to the shoulders, but rarely into the arms or lower back. The pain of cervical facet syndrome is made worse by motion of the neck and other physical activities. Muscle spasm in the neck may also be present. There are many other causes of neck pain that may be confused with cervical facet syndrome such as cervical bursitis, inflammatory arthritis, cervical radiculopathy caused by bulging discs and others. Cervical facet syndrome can coexist with other causes of neck pain. So it is possible to have more than one problem causing the discomfort. The diagnosis of cervical facet syndrome is made by doing a thorough history and physical exam. X-rays and MRI scans can be useful to identify diseases of the cervical facets as well as to identify and exclude other causes of pain. Laboratory exams to look for evidence of inflammatory arthritis are also useful. Treatment of cervical facet disease starts with conservative modalities, such as rest, heat, ice, physical therapy and non-steroidal anti-inflammatory drugs. Injections into the joints can be useful in refractory cases. In situations where the pain is persistent and identified as coming from these joints, radiofrequency destruction of the nerves that supply these joints can be successful in giving pain relief.